Ponies For Parties was originally conceived in the 1970s by Derel Lee Twombly. She saved for college tuition by giving riding lessons and occasionally scheduling pony rides for birthday parties. 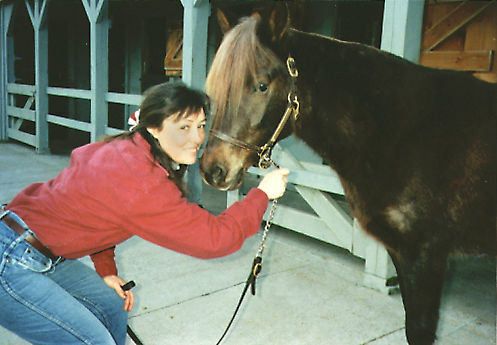 In May of 1980, she earned a Riding Master’s degree at Meredith Manor School of Horsemanship in Waverly, WV. She began a career in her chosen profession with a busy schedule teaching students in the equine disciplines of Dressage and Hunt Seat Equitation. Gradually, however, she found that her safe, gentle ponies and horses were requested so often for birthday parties, that Ponies for Parties was established in 1985. Since that time, thousands of special occasions have become even more special with pony rides from Ponies for Parties. Our company maintains a professional, up-scale image by engaging trained, uniformed “pony walkers” who lead each pony individually. Our horse transport vehicle operates from dawn to dusk year round to accommodate many clients each day. Ponies for Parties does carry liability insurance. Nonetheless, we have always believed that our best insurance is our gentle, high quality ponies and our attentive, concerned pony walkers.